A teacher I know who teaches at Devonport High School for Boys has just retired after 6 years as a teacher at the school. On the 11th of April he is going to start a new life in New Zealand. He is traveling by bus and plane. This is the cost of their journey of two adults and two children to New Zealand. Good luck to the Jessops! The only Torpoint Volvo Olympian 34002 proved a very unreliable bus since her introduction in March 2006. It has been said "She spends more time off the road than off the road". Her Volvo Penta engine has been the problem. There has been many mechanical and electrical falts with her. It has until now been fixed in the Depot at Torpoint but it is such a major problem it has now been sent to Laira Depot for what we think is a new engine or a major overhall. It has so far been away for about 3 weeks so it should return soon. 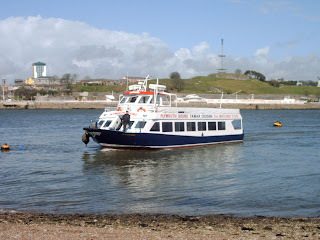 Yesterday the Plymouth Sound of Tamar Crusing did its first dockyard and Warship Cruise of the year. It has also just been refurbished in its place of birth at Voyager Boat yard. 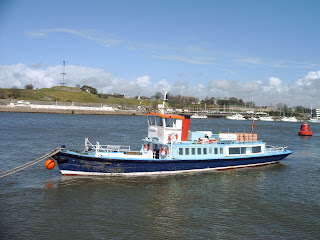 This will now run the cruises along with the Tamar Belle until the end of the season. Yesterday a steam train from the 50's which I think was 40868 but I am not totally sure and its 50's coaches operated the route from Plymouth to Bere Alston covering the route for a DMU. Many regulars were surprised and enjoyed the journey a lot. There were also a lot of enthusiasts came down from as far as Scotland but really I think they would be a bit disappointed because its only about a 15 minute journey. 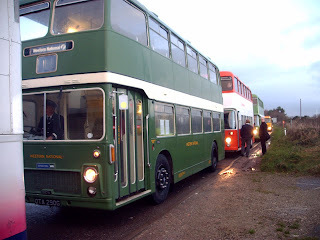 OTA 290G on her way with other Bristol VRs to the Bristol VR final running day in Penzance. 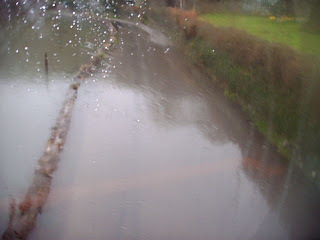 Saturday March 31st 2007 will see the closure of First Devon and Cornwall's Ilfracombe depot. This depot is the only ex-tilling depot still in use and will be a momentous occasion for bus enthusiasts. 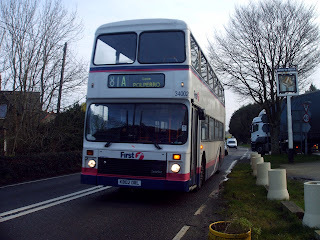 Hopefully there will be ex buses and drivers there to run the last service ever which is Duty 1116 which will definitely be operated by ex-Ilfracombe bus 1056 OTA 290G. At the end of the last route ex staff of the depot and current will perform the last rites. It is hoped that there will be special tickets produced and the staff will wear old fashioned uniform and there will be two other ex vehicles there throughout the day. 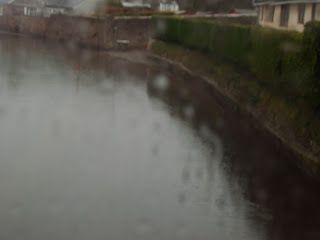 Well the Spring high tides are now over so I just thought I would put some on of this year. 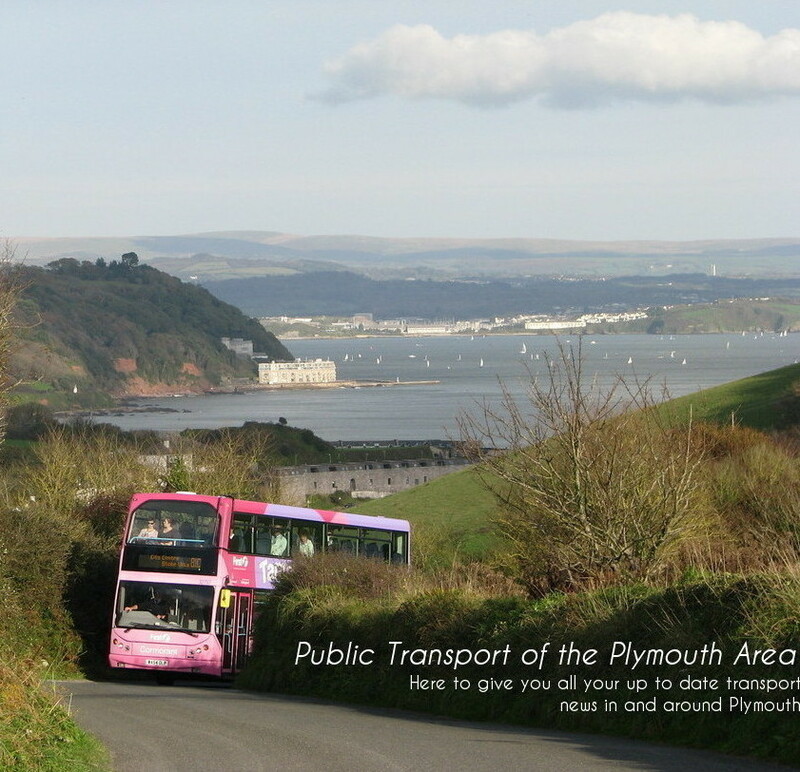 It covers all the public transport around Plymouth and is updated about once too twice a fortnight. Happy Browsing. Two of the new Dennis Tridents Plaxton Preasidents have made it to Plymouth. I was speakinh to a driver today who told me they had arrived two days ago. They ex-London buses which were used on the Park and Ride service before we got the Dennis Enviro 400s These buses will be used only on route 93 Plymouth-Dartmouth. They have been painted in a new livery of Cream, Blue and Green with branding for "93 Mayflower Link". The middle doors have been taken out and the seating has been renewed. These buses shold come into service by the start of April. Pont Aven's costs are redused. The Pont Aven is the Flagship ferry of Brittany Ferries. 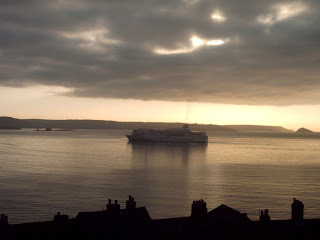 The Pont Aven as I have mentioned in a previous blog has just come back into service following its refurbishment. Newly announced is that the journey time on its route from Plymouth to Santander is to increase from 18 hours to 24 hours to save money on fuel bills. It is estimated it will save around 8% of the average cost. This might mean that fares could come down. If the fair does decraese by 8% it will now cost £52 instead of £57. Photo courtacy of Luke Farley. The Seabus was built a few months ago in Voyager Boat yard in Millbrook. It will be used for the ferry from Renfrew to Yorker in Glasgow. It is painted in the Company's Strathclyd Passenger Transport livery of black, maroon and cream. 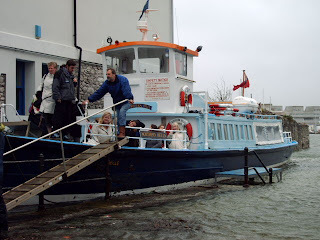 The boat uses a Gardener 8LXB engine and is licenced to carry around 150 passengers. When it was finshed it did all its trails and passed them all but the company weren't ready for it so it has been sitting a Voyager for about 4 months but yesterday it set sail on its journey to Glasgow. 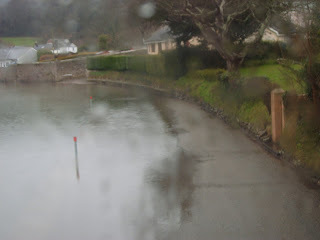 The Spring High tides over the next couple of days have thretend running of ferries and buses. 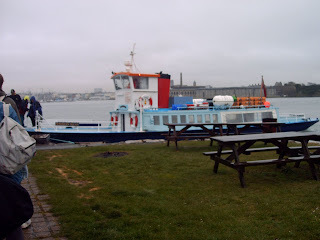 The Torpoint ferries are down to two ferrys which has caused major disruption. 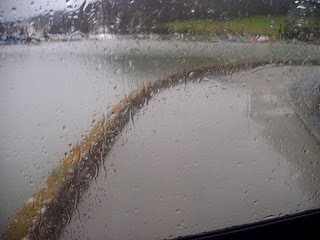 The passengers om the Cremyll ferry are having to jump off it to avoid getting there feet wet and route 81B pictured above runs around Millbrook lake and has to wade itself through all this water using the ferry lift on the Leyland Olympians. Could be worse on the buses; when the Vrs wear in service it used to leak through the floor. As I have mentioned route 34 is now operated by Brand new Dennis Enviro 200s. I thought the introducion of these new buses might have made the route on time along with the revised timetable, many letters and phone calls to Citybus and the petition being signed by many regular travelers on the bus to Citybus and the old transport secretary. Countless times it still misses the Cremyll ferry meaning they are getting home up to 40 minutes later than if the bus was on time, lets hope they will finally get it into there heads that the bus is always late. Northern Belle docked off Cremyll. 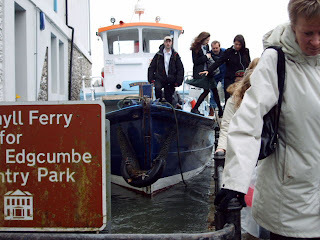 The Northern Belle has run the Cremyll ferry service from Cremyll to Admirals Hard for just under 81 years. It is shortly going to be taken out of service and replaced, thought there is a slim chance it will have a major refit re-building nearly the whole boat. This will happen any time within the next 5 years and will have to be replaced by 2012 because of new regulations being put into place at that time. I will keep you posted on this but it looks like it will be a bitter end to such a hard working boat. 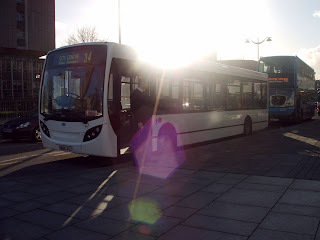 I mensioned in a previous blog that the Enviro 400s have been having electrical problems. 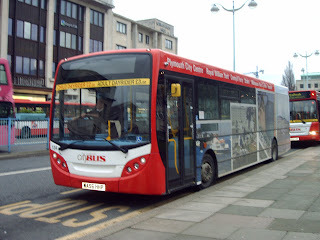 Plymouth Citybus also bought three Enviro 200 to run soley on route 34 but these are also going wrong. These have been having engine failers and they need three buses to run the route so they are having to rope in a replacement Enviro 200 from Alexander Dennis. Since they joined the fleet replacement bus SN56 AXJ has made three visits and has become a regular site around Plymouth. Lets hope they can fix these aswell. 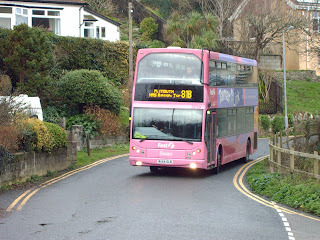 Dennis Trident 32759 in Cawsand. The rather unusual Tamar Link Dennis Tridents are now a familiar site in the area. But not for much longer. Within the next month they will be taken out of service on routes 80A, 80B, 81A and 81B because the route just isn't hevily populated enought to use such big vechicals. They will be reserved soley for routes 80 and 81. The buses that will be used indtead are the Mercedes Varios, the Dennis Dart, The Volvo Olympian and the Leyland Olympians. The T.V screens onboard 33417 showing an error display. The Park and Ride buses are Dennis Enviro 400s brought into service on First's new St George park and ride route. The buses are all high tec and have T.Vs and radios but there are still electrical problems 3 months from when they started service. 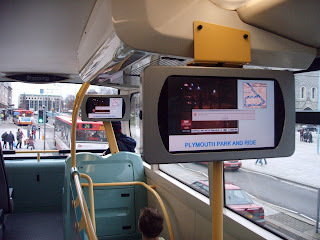 The main one shown in the picture is that the T.V screens don't work and stay frozen on information about Plymouth and news channels. The other is the Air-Conditioning system is automatic but it won't turn off, you can hardly hear the engine for the noise it makes it is a racket. Hopefully it will be fixed in the near future, we will have to wait and see. To the left is the Pont Aven in Cawsand bay getting ready for the first trip of the year. The Pont Aven is Brittany Ferries flagship vessel. It has just come back after a refit over the winter period. We think that they won't have done anything major like an interior change as the boat is only 3 years old. The only jobs we know have been done are that one of the front decks of windows has been taken out because of smashed windows on a voyage last year to make sure it doesn't happen again and that it has been repainted. It will now run the route between Plymouth and San Tan Der in Spain for the rest of the season.